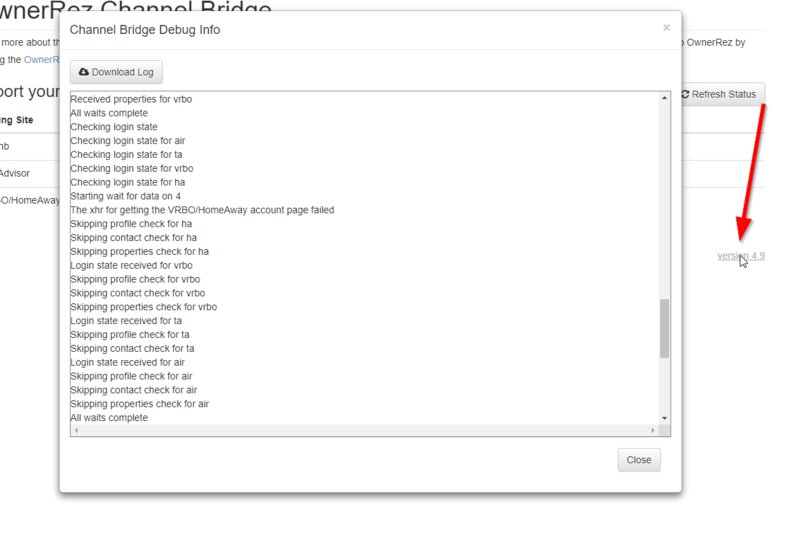 I'm attempting to use Channel Bridge for the first time to get reviews from VRBO. I believe I've done all the setup steps correctly. The Channel Bridge extension says I'm connected to VRBO, but when I press the button to export reviews, it hangs (for hours) spinning and saying "analyzing your VRBO/Homeaway reviews". Note that I have less than 10 reviews so I wouldn't think it would take too long. This may be happening because the properties list in Channel Bridge is not populating correctly with your VRBO properties. It should only take a few seconds to analyze the reviews and spin through them even if you have hundreds, and you would see an ongoing status updated in that box as it worked its way through. We are tracking an issue with several users on this right now. Thanks for reporting it. If you log out of VRBO, close your browser tabs, then come back in and click on Download Bookings button, do you see properties in the "All Properties" drop-down? The only entry in the All Properties menu box is "All Properties" - my property is not specifically shown. That's what I figured. We are working on a hotfix for that as I write this. We identified this earlier today with others. Will circle back to this thread when Channel Bridge is updated. FYI - for others seeing this, it only appears to happen to some users, not all. Let me know if, after getting the update, you see properties in the down-down list for VRBO when clicking the "Download Bookings" button. And the reviews button should be fine as well. It still doesn't show my property in the drop-down. However, the Reviews button now comes back and says there are zero properties. I will email the log to help@ownerreservations.com. Let me know if there is a better email address to use. I'm on the latest version and it says "No Review Found" yet I have more than 100 reviews. Hi Marina's Edge, can you follow the instructions above about sending your log in? We're seeing this from a wide sub-set of VRBO users. That log helps a lot. Seems this is also our problem. How do I send a log, if that help? Where do I get that? After updating, check the "Download Bookings" button next to VRBO and see if the properties down-down now shows your properties. The "Download Reviews" button should work as well.